A habit-forming FPS for its strategic possibilities and tactical depth, but the lack of matchmaking is especially worrisome. What Is It? A class-based multiplayer FPS of construction and destruction. I’m digging a tunnel. It’s an important part of my sneaky plan: forego the obvious deathtrap of the single, elevated causeway spanning the battleground for a stealthy subterranean insertion into the enemy base. Behind me, a few teammates wriggle along, accomplices to a hopefully glorious flanking action. They wisely let me forge forward first; I’m playing a Cogwheel, the tanky, clanky robot character sporting a deep health pool, a rotary cannon arm, and a permanent grimace. I scoop out an alcove in the tunnel’s wall and place a radar block. Above, enemy players and their ramshackle defenses light up in red outlines. They’re all aimed at the bridge. How tactically passé. I gouge a few more feet into the tunnel before angling upwards. Scant layers separate me from my objective: a thrumming shield cube. If I topple it, the base’s primary power cube would become vulnerable. I scratch a topside hole and jump out, a heroic vanguard of my robot mole army—and run right into an awaiting gas mine. Before my brain can process how a robot can suffocate to death, I’m toppling backwards into the tunnel in a heap. Sarge’s machine gun is a bullet hose, but he’s susceptible to close-range attacks. That means any sort of plan, because heading into a 5-on-5 round without one guarantees a frustrating loss. Strategizing is a moment-to-moment requirement starting from conspiratory chats in the pre-match lobby to a power cube’s final blow. I liked that emphasis on teamwork encoded directly into BNL’s DNA, and it’s best represented by the spread of special blocks and weapons each class carries into the field. Sarge Stone, a demolitions-oriented soldier, uses TNT, grenades, and a rocket launcher to clear multiple blocks with big booms. Antony Turretto is predictably angled for defense with his turret blocks and ammo and health dispensers. Doc Eliza eschews a traditional healer role for area-denial gas grenades and traps but can still restore life with a rejuvenating pulse. The rest of the cast follows suit, and the spread of abilities covers a respectable range of gameplay styles—I really enjoyed the mobility of O.P. Juan Shinobi, a hilariously named katana-wielding ninja who tosses smoke bombs and teleports to wherever they land. I’m reminded of the skill diversity found in MOBAs but compressed to a smaller selection of characters. Like TF2’s band of mercenaries, BNL’s heroes strike visually distinct profiles reflecting their intended role. Yet some of the best fun had in BNL arises from utilizing a map’s go-anywhere destructibility together with a character’s loadout in new and interesting ways. Eliza’s gas bombs are super effective at blanketing a shield cube with constant protection, inflicting pain on any encroaching attackers. (Hitting the cube with a dig tool deals the most damage to it.) I’ve witnessed a Turretto assault a base by leap-frogging turrets shoved into hastily built brick bunkers. The opportunity for new techniques with the tools BNL provides is quite evident. When all the ordnance flies around, blocks start falling. Structures crumble with colorful and cartoony puffs of smoke and dust, occasionally causing slight chug on my 8GB RAM, GTX 670 home PC as it tosses handfuls of physics calculations to the server and back. Surmounting ruins and block piles is easy enough on standard WASD controls, but jumping feels slightly too feathery for precision landings and behaves wonkily when mantling individual pieces. I’d sometimes sail right over the surface I tried climbing on into boiling lava or a chasm. O.P. Juan Shinobi’s mobility excels when flanking behind for sneak attacks. It’s also tough to figure out an ideal blueprint for building defenses given the near-omnidirectional routes players attack from. A decisive factor determining a win or loss is quickly patching up holes blown, shot, or dug out of fortress-like walls or pits constructed during the minutes given to prepare defenses before a round begins. This loops back to the importance of planning and working together. BNL has a matchmaking system, but its functionality only involves throwing together the first ten players in the queue. That’s a pretty big issue: beginners are welcomed with a basic tutorial, but nothing is in place to prevent solo players encountering a premade group talking on TeamSpeak. Steamrolls were fairly common in my 12 hours of play, and the small team size suffers when players quit early out of frustration. A ranked mode exists once players reach a certain level in the progression system, but that entails plenty of hours rolling the dice with randomized teams. Those faults aren’t exclusive to BNL, but they’re notably amplified given the heavy prominence on teamwork over lone-wolf gameplay. It’s not fun dealing with an abusive teammate digging out the floor around the spawn room or intentionally destroying their own turrets and walls, but it’s also equally discouraging when trying to get everyone to work together. Cheesy strategies—spamming rocket fire from an ammo block for the entire match, trickling into the enemy base one by one on suicide runs, and so on—are popular because they take less effort. Some of the best fun arises from utilizing a map’s go-anywhere destructibility with a character’s loadout in interesting ways. Also of slight annoyance are respawn timers which start at 10 seconds and increase incrementally for roughly every minute passed during a match. I liked that dying steadily becomes more costly, encouraging smart movement and breaking off deadly engagements, but I didn’t appreciate sometimes being stuck with stalemates running over 30 minutes in length when both sides turtled their cubes for what felt like eternity. Turretto can repair turrets with his caulk gun. No comment. Only a single mode exists so far, and while the attack-defend framework fits it well, monotony can easily set in. I’d like seeing other multiplayer staples eventually capitalize on the power to build or destroy nearly everything. Chasing down a flag carrier as his or her team tries to frantically toss in obstacles along the way in a CTF-style mode sounds particularly excellent. 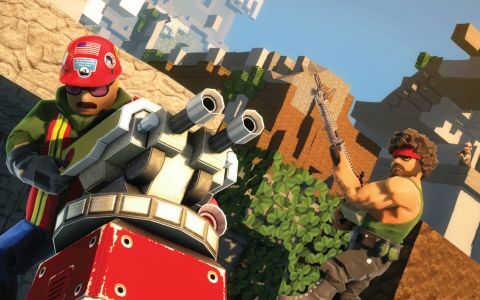 There’s promise for Block N Load, and it’s already apparent in its baseline design of fun and chaotic strategy. With a few tweaks to its behind-the-curtain systems and further improvements, it could very well rival TF2 for approachability, quirkiness, and staying power. Slicing up a map and putting it back together again is always amusing and a huge potential candidate for Steam Workshop support. If anything, I recommend downloading the free demo which only restricts the amount of playable heroes.